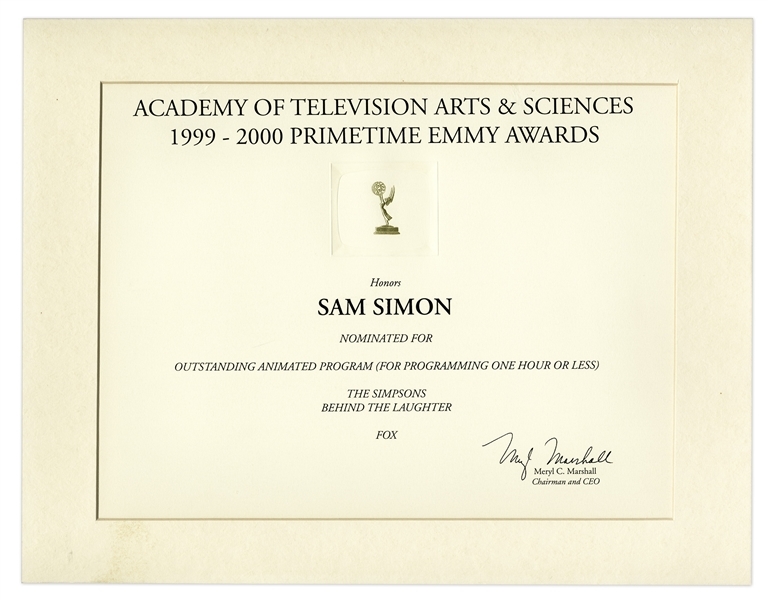 Primetime Emmy nomination certificate given to Sam Simon, co-creator of ''The Simpsons''. Matted award nomination features iconic Emmy award in raised gilt and reads in full: ''ACADEMY OF TELEVISION ARTS & SCIENCES / 1999-2000 PRIMETIME EMMY AWARDS / Honors Sam Simon / NOMINATED FOR OUTSTANDING ANIMATED PROGRAM (FOR PROGRAMMING ONE HOUR OR LESS) / THE SIMPSONS / BEHIND THE LAUGHTER / FOX''. Certificate measures 14'' x 11''. Near fine condition. From the Sam Simon Estate.